Let me know if this post isn't allowed and I'll edit/remove it right away. I recently found out that I'm pregnant; I estimate that I'm about four to five weeks along, since I waited for three weeks after my last missed period to get a test. I do plan on getting an abortion; hopefully by manual vacuum aspiration if at all possible. My question is this (and the reason why I'm not sure that this is "appropriate" for this community, but I wasn't sure where else to ask): For the past four days or so I've been having light-to-moderate brownish, sometimes mostly reddish discharge, similar to what I've had towards the end of my period if I had a period that was particularly light/long-lasting. My question is... Is this just something that happens during the first few weeks of pregnancy? Or could something else be going on? Impending miscarriage/blighted ovum? Anyone have any ideas? I'm just confused and curious. This post is xposted to three communities. I think this point can be said for any pregnancy choice. Women’s sense of responsibility for their existing and future children influences their decision to seek an abortion, according to “‘I Would Want to Give My Child, Like, Everything in the World:’ How Issues of Motherhood Influence Women Who Have Abortions,” by Rachel Jones et al., published in the January 2008 issue of the Journal of Family Issues. The majority (61%) of U.S. women who have abortions are already mothers, more than half of whom have two or more children. In many cases, women choose abortion because they are motivated to be good parents. Women who have no children want the conditions to be right when they do; women who already have children want to be responsible and take care of their existing children. In addition, many of the women surveyed made direct and indirect references to the “ideal” conditions of motherhood, expressing the view that children are entitled to stable and loving families, financial security, and a high level of care and attention. Because the women were unable to provide those conditions at the time, they did not feel they were in a position to have a child or, if they were already mothers, an additional child. Without being asked directly, several of the women indicated that adoption is not a realistic option for them. They reported that the thought of one’s child being out in the world without knowing if it was being taken care of or by whom would induce more guilt than having an abortion. This study was based on in-depth interviews with 38 women who obtained abortions in the United States in 2004. These women were a subsample of larger study focused around the reasons for and context in which women are making decisions about abortion. Show your support for sexual and reproductive health and rights—make your donation to the Guttmacher Institute on our secure Web site. If you need to change your e-mail address or no longer wish to receive these announcements, click on the "manage your subscription" link below. A group of my classmates are doing a paper on Women's Rights and they kind of need statements from women who've experienced certain things that encompass or resonate important social issues. And one of the things they're trying to present are testimonies of women who've taken up personal stands on pro-choice. I know, abortion is altogether extra degrees above what we collectively consider as 'sensitive human rights issues' and it's not something that's easily talked about but we think our classmates, our batchmates, need to open up and understand what the whole issue really counts for. The questions aren't really very thick on personal, they're kind of very flat and they're under the cut. I don't want to rile up anything and I hope I don't spark up any arguments. It would really help if you guys can say something about it. You can certainly post anonymously if you'd like to. So there, and much much thanks in advance. We want to adopt and believe the right match will happen if we make ourselves available. It may be the option/choice someone is looking for. Please ask any questions without fear of judgment or pressure. Do you want to learn more about reproductive freedom and social justice? Or are you a longtime activist looking for inspiration and rejuvenation? Whether you are new to the movement or a veteran organizer, join us at the 21st annual national conference “From Abortion Rights to Social Justice: Building the Movement for Reproductive Freedom.�? 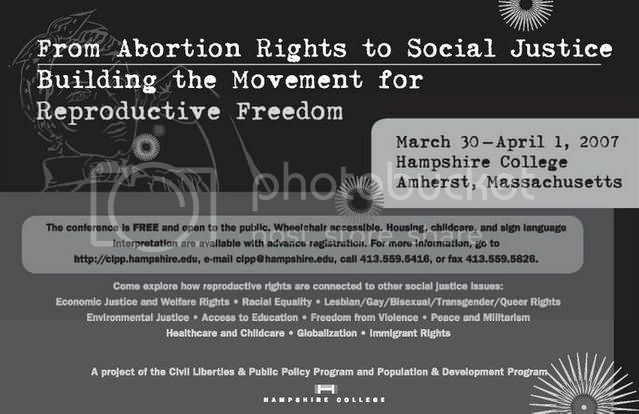 On March 30-April 1, 2007, campus and community activists will be gathering at Hampshire College to unite for reproductive justice. We are expecting a large turnout—last year there were over 1000 participants from the US and abroad. We offer more than 30 workshops and trainings. Conference speakers address reproductive freedom as it relates to a broad range of social justice initiatives including economic justice, health care reform, racial equality, the war on terrorism, freedom from violence, youth liberation, civil liberties, and LGBTQ rights. Over the weekend, you will deepen your understanding of issues you already know about, make new connections, and unite with others who are passionate about working for social justice. Free housing (in Hampshire dorms) and food are provided for the conference weekend. Free childcare and sign language interpretation is also available. I'm currently working on a screenplay about teen pregnancy. I want to aproach this subject with the up most respect, however never having been pregnant myself I lack information. If you have a moment (and strong feelings about this subject) would you be willing to stop by my journal and fill out a small questionaire? I would greatly appreciate it. I work at the Women's Resource Center at my college, and as one of the projects I am working on this term is organizing a series of events surrounding pregnancy choices. One of the events will include a series of films surrounding each of the subjects of choosing abortion, adoption and parenting. With the current Pro-Choice movement, there is a lot of material on abortions, but I can't find anything on adoption through the birth parents view. Adoption films are usually about the adoptive parents or the reuniting of adoptive children and birthparents; never about the emotional complexities of choosing adoption while living with that choice. If anyone here knows of films (I prefer documentary, but will settle for a fictional film) that illustrates these emotions surrounding choosing adoption and parenting, I would gratefully appreciate recommendations. This may not entirely belong here; I'm not pregnant, in fact the point is that I'm vaguely planning to never get pregnant. My boyfriend and I talked about babies last night since it was our 5th anniversary. Normally when we talk about babies, I get broody and he finds it funny and tries to distract me from seriously thinking about babies, but he did say yesterday that we would probably need to have had kids within 5 years, since he'll be coming up to his 38th birthday in 5 years. So I started to think about it, and a worry I've had came up. I have a lot of bad medical conditions. I am physically disabled and I have mental health problems. 1 of the conditions I have confirmed DX for has a tendancy to be passed on to children this can be very physically disabling. 1 is a definite genetic coding, and that's my mental health issue. 1 of the conditions I'm waiting for tests to confirm is a genetic coding thing as well. 1 of the conditions I have I don't know about; apparently it's just about impossible that I was born with it on both sides of my body anyway. And I have minor asthma and psoriasis, and my boyfriend has pretty bad excma so our kids would probably get excma (sorry I don't know how to spell that!) as well. Ignoring the physical difficulties I'd have to go through to actually carry a baby 9 months and give birth, I'm REALLY worried that if we have children they're going to have to suffer the horrible disabilities I've suffered from. If I got pregnant, there would be no question; we would have that child. I am pro-choice, but I could not have an abortion myself due to Religious beliefs. My boyfriend is ok with that and fully supportive of that choice. But although I think that giving a disabled child the chance of a life is a good thing, I'm not sure I could actively plan for a child when I know that doing that could bring a disabled child in to the world. I don't think it would be fair. And there are plenty of children needing adoption who would benefit massively from a couple that really do want children and would love them where they may not have the best life in the foster system. We're not even going to be trying right now; I'm a mature student, and looking at it I think the best time regarding my degree, and our ages is probably in 2-3 years, but it's nagging at me now, and I've heard that adoption can take years, especially since I'm disabled, though they say that won't count against me; in fact it can be a good thing because any children we adopt would learn about disability early in life, or we'd have a better idea of how to cope with a child with disabilities. Also, if anyone knows; I was abused as a child, will that count against me at all? I personally think it's more likely to make me love children more and make sure they're protected, but there's all those weird stats out there about abused kids becoming abusers themselves and stuff; it worries me that social services might not want to adopt a child out to someone who was abused. If this is the wrong community to ask this, I'm sorry! I couldn't find another really active community to ask this! Vote NO on Prop. 85! Hey All - My name is Justin. I'm a volunteer with NO on 85, a coalition that includes Planned Parenthood, The League of Women Voters, NARAL, ACLU and others. I'm glad this community exists for those who feel comfortable finding the help they need online. I am 24 years old, and have been interested in the reproductive rights movement/education and advocacy work for the last few years. I believe it stemmed from a trip to Romania in 2003 where I worked with orphans, which led to my writing of a thesis on the reproductive rights of women in communist Romania, for my BA in women's studies. I am currently a talkine advocate for backline, along with hellobutterfly. I am also working with a team on a minor's rights project for backline, and researching information on five states that will be available to minors and professionals, in print and online later this year. I hope I can be a listening and supportive person for anybody with questions in this safe space.